I just made a delicious zucchini- banana bread this week with some fresh, local, delicious zucchini. If you got some zucchini at the market recently, check this recipe out! Preheat oven to 350 F. Lightly grease an 8×4 metal bread pan. In a mixing bowl, mash the banana well, until no large chunks are left. Add the applesauce, canola oil, sugar, and vanilla and use a strong fork to mix well. Mix in the grated zucchini. Sift in 1 cup of the flour, the cinnamon, allspice, baking soda and salt. Mix to combine. Add the walnuts, raisins and final 1/2 cup of flour, and mix just until no visible flour is left. Transfer batter to the prepared pan and bake for 50 to 55 minutes. Test for doneness with a toothpick or knife. If it needs more time, turn heat down to 325 F and bake an additional 10 to 15 minutes. Let cool in the pan for 10 minutes, then transfer to a cooling rack to cool completely. 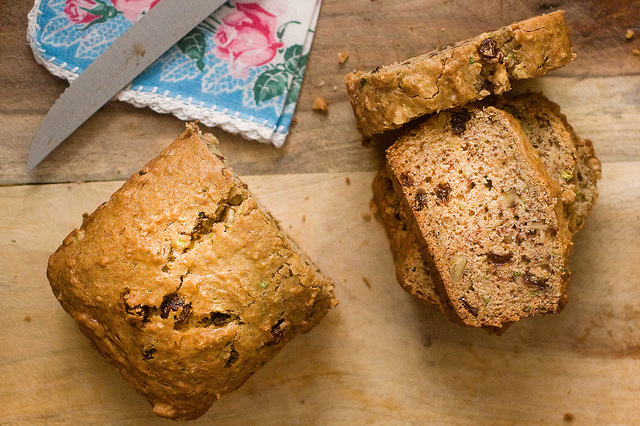 This recipe is can be found at http://www.theppk.com/2013/07/zucchini-banana-bread/, follow the link and get some great tips for the recipe. This entry was posted in Baking, Recipes, Zucchini and tagged zucchini. Bookmark the permalink. ← My Pantry and Heart’s Content Organic Farmstead — September 12!